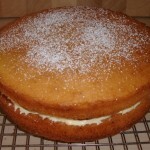 A Victoria Sandwich is a British food recipe of cake with lemon cream. In a bowl, beat eggs with an electric mixer until frothy. In another bowl, beat margarine and sugar until creamy. In another bowl, sift flour and baking powder. Add a little egg to margarine/sugar mixture and beat well. Add a little of the flour and baking powder mixture and beat. Repeat alternate additions of egg and flour, beating constantly until all is well blended. Add lemon juice and zest to batter and beat well. Grease and lightly flour the sides and bottom of two 7 inch cake pans about. Spoon equal amounts of cake mixture into each pan and spread evenly with a spatula. Bake cakes in the middle to upper part of the oven for 20 minutes, or until their edges come away from the pans. Remove from the oven and allow to cool for 10 minutes in the pans. Then tip cakes onto wire racks to cool completely. 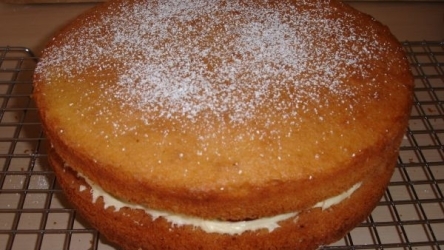 For the frosting, beat sugar, margarine and lemon juice and zest together with an electric mixer until completely smooth. To assemble cake, place one cake bottom-side-up on a serving plate and spread the top with half the frosting. Place other cake right-side-up on top and press gently. Then spread the top with remaining frosting.